Budapest – The FIFA World Cup is in full swing in Russia. Elsewhere, in countries including Hungary, preparations are being made for the UEFA Euro 2020 games. 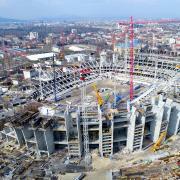 Due for completion in 2019, the new national stadium is under construction in the Hungarian capital. With the capacity to seat just over 67,000 spectators and with a footprint of 210.000 m², the rebuilt of Puskás Ferenc Stadium is slated for three group-stage games and one of the round of 16 games in the Euro 2020 knock-out phase. 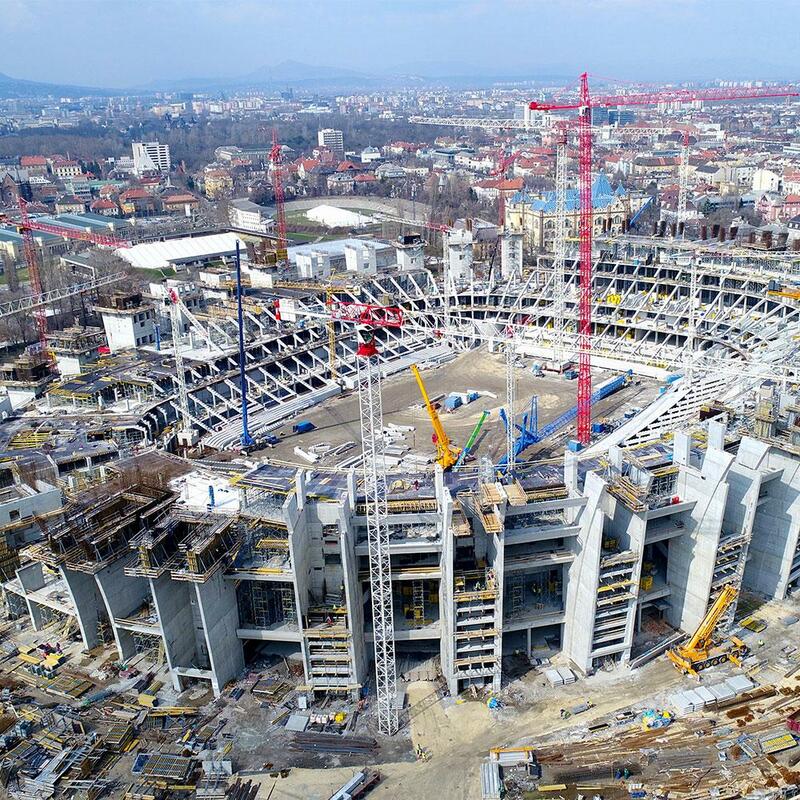 Doka supplied Climbing formwork MF240 in combination with Large-area formwork Top 50 for construction of the stadium's pylons. For both the European and Hungarian construction industries, the rebuild of the Puskás Ferenc Stadium, formerly known as the Népstadion ("People's Stadium) is one of the biggest projects ongoing at this time. 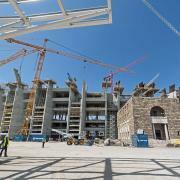 When finished, it will have 11 levels and measure 51 metres high and 316 metres long. The original stadium dates back to 1953. It will not be completely demolished. Instead, part of the original structure will be incorporated into the new stadium. Hungary's national team played a total of 192 official international games here in the period 1953 to 2014. The old stadium was officially closed on 5th October 2015. 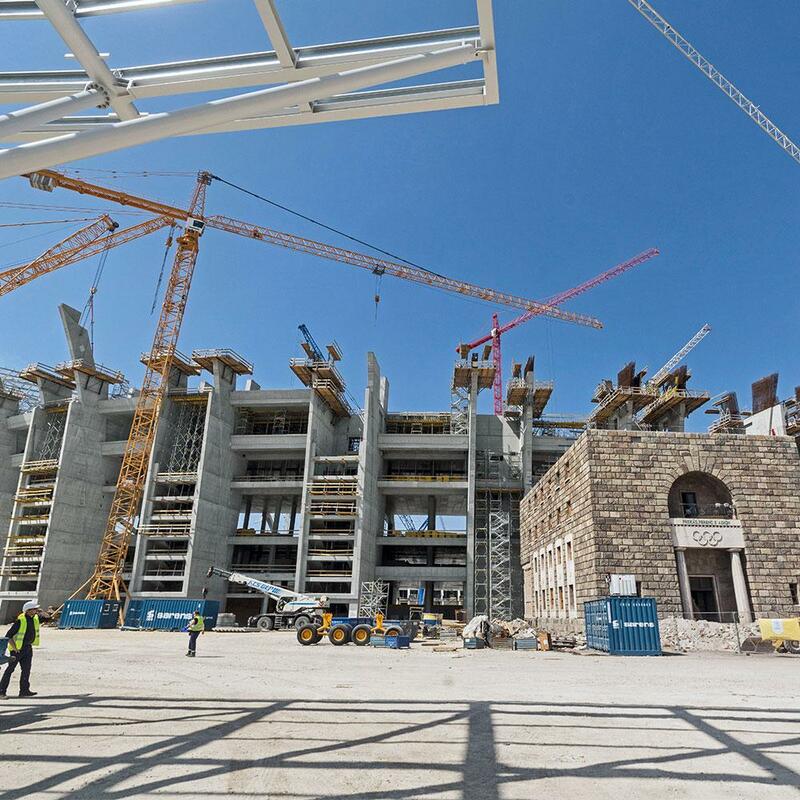 When completed in 2019, the new national stadium will meet the latest UEFA standards and will host soccer games and 20 other sports disciplines as well. The UEFA Euro 2020 was the definitive trigger for the stadium rebuild. That year will mark the competition's 60th anniversary, and for the first time ever matches will be played in 13 cities in 13 countries. 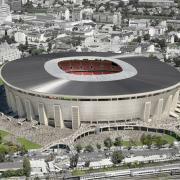 When Hungary was selected as one of the host nations, it was clear that a new national stadium would be needed in the capital, Budapest. The modern stadium features a transparent outside skin that screens multimedia projections, three spectator stands and, when work is finished, a museum of sports as well. In the interior of the structure there will be numerous facilities totalling 200,000 m² of floorspace and including a hotel with 150 rooms, a conference centre for 80 guests and 15 indoor sports facilities. In all, this project will require 127,000 m³ of concrete and 19,000 metric tons of reinforcement. The most striking feature on this project are the 38 pylons with variable geometry. They are 45 metres high and also form the supporting framework for the unique steel roof. 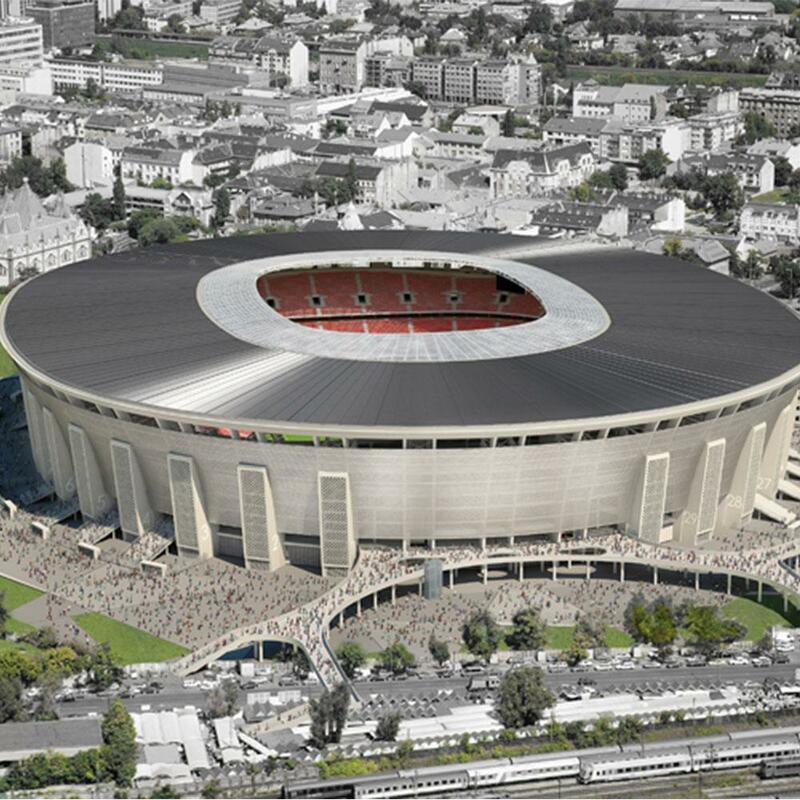 “During the planning phase, it was a very important aspect to preserve the Népstadion’s unique characteristic elements. Accordingly, the peculiarity of the project is the 38 pylons with variable geometry, which are 45 m high and also serve as supporting frames for the unique steel roof. Fortunately, this doesn’t mean any problem, because all three construction companies use Doka systems and services” emphasizes János Karakas, Project manager West Hungária Bau (WHB) Kft. 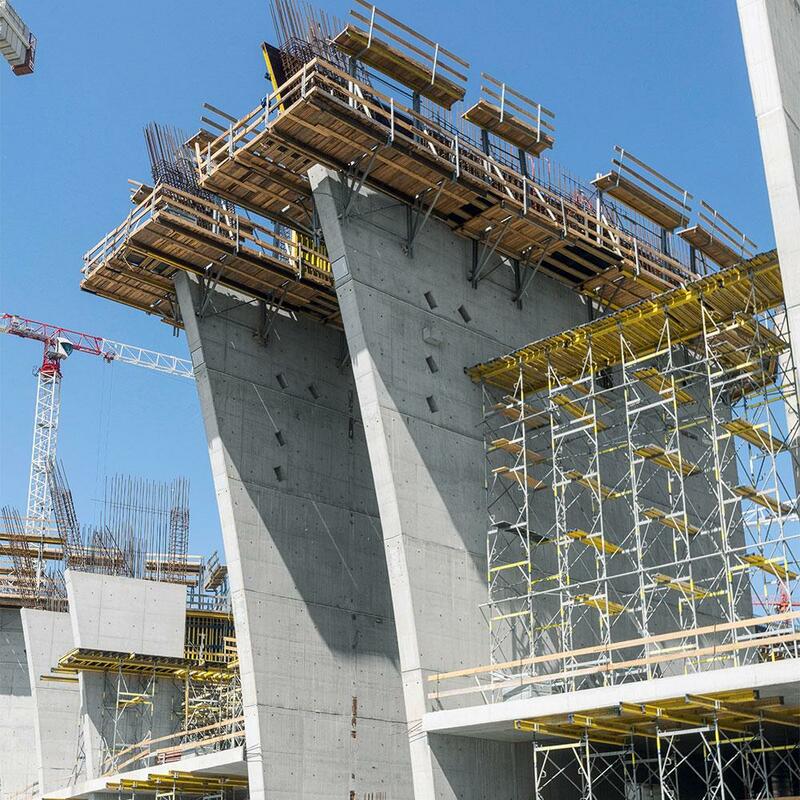 To comply with the customer's high requirements for safety and fair-faced concrete quality, 300 platforms of Doka climbing formwork MF 240 were used in combination with Large-area formwork Top 50 to construct the pylons. Climbing formwork MF240 can be used for structures of any shape and angle of inclination, adapting with outstanding flexibility to widely differing requirements. High load-bearing capacity (50 kN per climbing bracket) and the wide ±15° range of tilt adjustment for formwork and scaffold are among the system's most outstanding characteristics. The platforms 2.40 metres in width and the fully enclosed platform system offer plenty of space for fast, safe working. The 7m high slab will be supported by Eurex 20 floor props combined with Staxo 40 load-bearing towers. The Load-bearing tower Staxo 40 system stands out for being exceptionally easy to handle, and superbly adaptable to any building-construction project. Easy handling and the logical sequence of assembly permit efficient and safe progress on the build. - General Contractors: Magyar Építő Zrt. and Záév Zrt. - Subcontractors (concrete construction): WHB Kft. / PBE Kft. and Épkar Zrt. - Subcontractors: Bayer Construct Zrt. / Sankó-Ép Kft. / Épszerk-Pannónia Invest Építőipari Kft. - Formwork planning: Magyar Doka Zsalutechnika Kft. Thank you for your interest - The UEFA Euro 2020 can come. Thank you very much for your interest - The UEFA Euro 2020 can come.